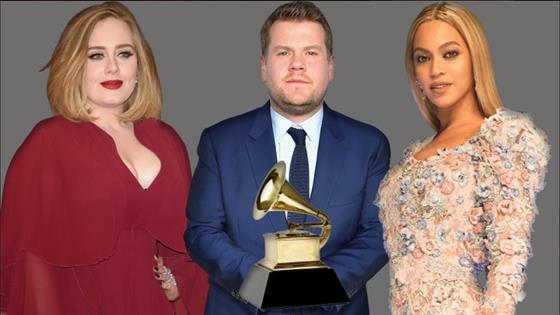 The 2017 Grammy Awards is well underway inside downtown Los Angeles' Staples Center, and from the flawless fashion seen on the red carpet to the show-stopping performances and every surprise courtesy of host James Corden in between, this might just be the music biz's biggest night yet. 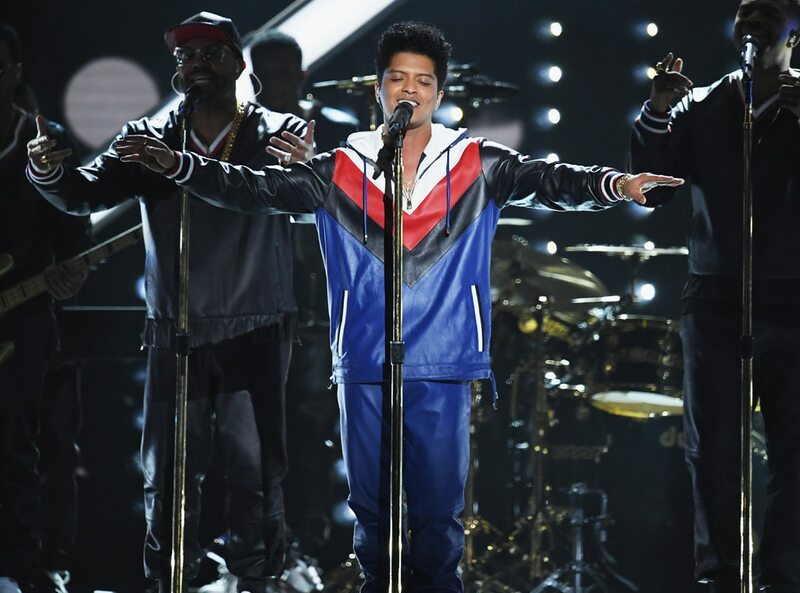 Put Bey's Love on Top: Doting hubby Jay Z gave his pregnant ladylove a helping hand when he assisted the singer in getting up from her seat to watch Bruno Mars and The Time pay tribute to Prince. Dressed in a stunning sequined red gown, the Grammy winner swayed from side to side to the funky music. Then there's Bey's entourage, who was also spotted cooling her off with a fan and brushing her hair. She is a goddess, after all, and should be treated as such. Stay Thirsty, My Friends: When James Corden was feeling dehydrated during Pentatonix's performance, a fellow Grammys attendee reached over and handed the host a cup of wine. According to an eyewitness, James looked "ecstatic" by the gesture and drank it gladly. Fond Memories: During a commercial break, the Recording Academy aired a clip from Bey and Prince's Purple Rain medley from the 2004 Grammys. The "Sorry" songstress watched fondly, surely reflecting on a career peak. All in the Family: After host James Corden caught his mom and dad canoodling with Heidi Klum and Nick Jonas in the audience, the comedian shared a sweet moment with the 'rents. After leaning over to kiss the supermodel on the cheek, Corden took his dad's hand and they walked down the aisle arm-in-arm to meet his mom before they all shared a sweet embrace. Girl Talk: Chrissy Teigen couldn't help but sing Adele's praises in person, running over to her seat during a commercial break for an intimate moment. The model and singer beamed from ear to ear while holding hands, and continued conversing even when the show started again. Date Night Done Right: If Bruno Mars' smooth as silk dance moves made you melt, you're not alone. Rashida Jones and her male date flaunted a little PDA by way of dancing and cuddling throughout his sensual rendition of "That's What I Like." Can I Get Your Digits? : Chance The Rapper was spotted mixing and mingling with Rihanna in the front row, and the pair might have even exchanged numbers! We are so here for this musical collaboration, if you know, that's what they were dishing about. Hey, Mama! 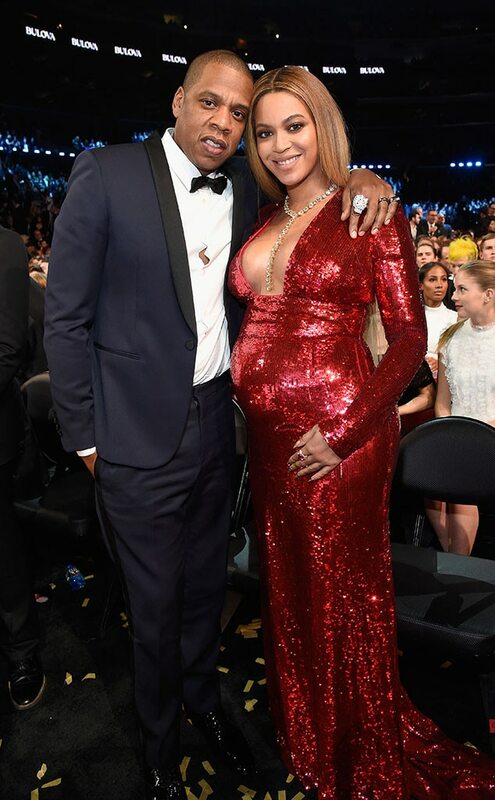 : While Beyoncégraced the Grammys stage with yet another perfect performance, Blue Ivy Carter danced and clapped her way through the first song before opting to take in the rest of the medley on dad Jay Z's lap. The father-daughter duo beamed with pride as they cheered on the expectant mother, and gave Queen Bey a standing ovation. Bravo, Blue! 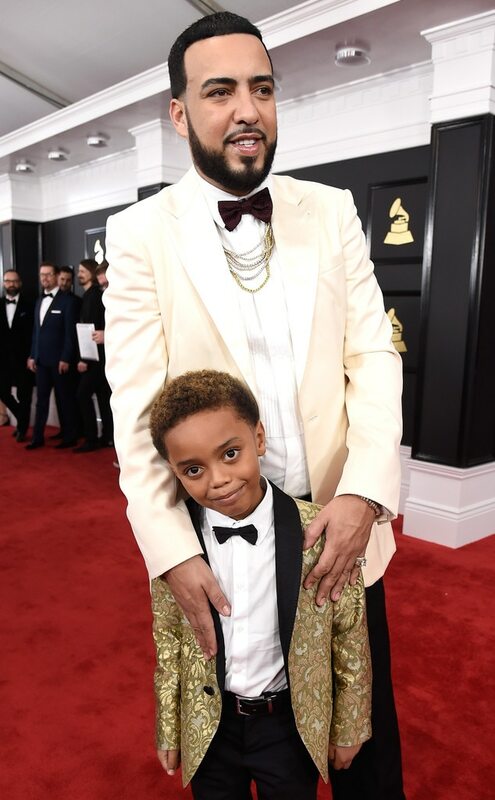 Like Father, Like Son: Rapper French Montana brought his 8-year-old son Kruz Kharbouch as his Grammys date, and in what could be the cutest behind-the-scenes moment thus far, was seen lovingly guiding his No. 1 fan through the crowd gathered in the lobby. Aww! Three Cheers for Chance The Rapper: The 2017 Grammy Awards' Best New Artist winner has one special supporter in none other than Katy Perry, who jumped to her feet when they announced his win over nominees The Chainsmokers, Kelsea Ballerini, Maren Morris and Anderson .Paak. Best Dressed Stars at the 2017 Grammys: Paris Jackson, Kristin Cavallari & More! No Pants Dance: One of music's biggest stars that loved Twenty One Pilots accepting their Best Pop Duo/Group Performance award sans pants? Jennifer Lopez, of course! The "Ain't Your Mama" singer was seen giggling her way through the acceptance speech with joy. Covert Entrance: During Carrie Underwood and Keith Urban's duet, Rihanna was escorted to her seat in the front row. She skipped the small talk with neighbors and instead intently watched the country music duo's performance. Talk about nailing a fashionably late arrival! All Eyes on Adele: Shortly after walking the red carpet in a stunning olive green grown, the five-time nominee changed into a shimmering red and black number to kick off the show with a moving rendition of "Hello." As the curtain rose and the lights dimmed, the entire audience erupted into anticipatory applause. She was helped off the podium and guided toward the back, where she embraced a few friends before heading backstage.